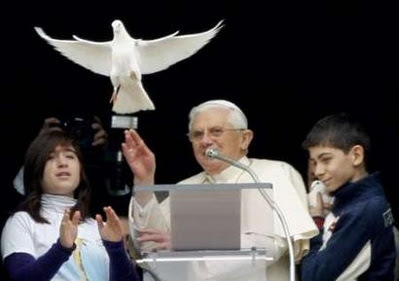 Before a cheerful crowd that had gathered in St Peter’s Square for the Angelus, Benedict XVI with two young people from Rome’s Azione Cattolica at his side released two doves in what has become a traditional gesture. Taking advantage of the situation the Pope cracked a joke that elicited shouts and applause among the 50,000 people in St Peter. “Sometimes they come back,” he said referring to the fact that occasionally the birds flow back into his studio.